Shears2You holistic facial treatments include organic skin care products in combination with FDA approved technology for superior results. * Professional high frequency facial skin care treatment together with organic skin care products help treat and prevent stubborn acne, rejuvenate aging skin, shrink enlarged pores, reduce the appearance of fine lines and wrinkles, decongest puffy eyes, and fade dark eye circles. * Anti-Aging Light Therapy Skin Care System - Boost your skin’s appearance with our organic skin care products and FDA approved infrared wavelength treatments that penetrate deep below the dermal layer helping to reverse current signs of aging while also preventing future signs from forming. This healthy and natural form of therapy stimulates the skin on a cellular level, promoting collagen production and cell renewal; both necessary to tighten, firm and revive tired skin. See fine lines and wrinkles diminish. 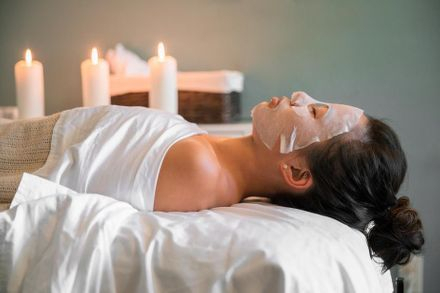 Our facials include a throrough skin analysis, deep cleansing, exfolihation, steam treatment, extractions, high freuquency and light therapy, treatment mask, and theraupeutic massage. Each skin type has a specific set of characteristics and symptoms. Your facial will be designed according to your special skin type needs. All of our organic skin products used for facials are curated according to your type of skin. (Normal, Dry, Oily, Sensitive, etc.) We will also be recommending take home products for everyday use to maintain healthier skin!